If you haven’t been to Montreal before, I’m so excited for you to discover all that it has to offer. And if you have visited and you’re ready to go back, I’m sure you’ll be excited to see additional amazing attractions that Montreal has to offer. For those of you coming in groups, be sure to book a chartered bus for your tour. It will be much simpler to get around, as driving in Montreal can be a bit tricky. Your driver will know the best routes, will be able to avoid congested areas, and get you to and from your destination in safety and style. Let’s get into some of the spots that you need to visit while you’re in Montreal. Some essentials, some for the whole family, and a whole lot more. Let’s get started! These are the spots that you absolutely do not want to miss out on. They represent the very best of Montreal, and give you a glimpse into the past while still surrounding you with modern comforts and amenities. They are hot-spots for tourists and locals alike, so make sure you drop off your group in a chartered bus to avoid trying to find parking. A little more than 400 years ago, French fur traders started using the area now known as the Old Port of Montreal as a trading post. Two hundred years later it officially became the port of Montreal and remained occupied until 1976 when they moved the port a few miles up the St. Lawrence River. Since then, the area has been developed into a world-class tourist destination with activities for just about everyone. Check out the Montreal Science Centre, and don’t forget to grab a movie at its IMAX Theatre! The Montreal Clock Tower is a great sight, and located just next to it is an urban beach where you can get your tan on in the summer! The Old Port is lined with restaurants and bars, and even an ice cream shop or two. And if you need a walk once you’re full, there’s a great walkway along the river, with a spot for cycling and rollerblading right next to it. Located nearly in the middle of the island of Montreal, Mount Royal is rich with history, and a perfect spot for a group tour. It’s a beautiful area with an abundance of greenery in the summer, and enough snow in the winter for a quick toboggan ride! There are hiking trails, points of historical interest, and a lot more. Most of the mountain is dedicated to a park space that, interestingly, was designed by one of the co-designers of Central Park in Manhattan. Let’s take a look at a couple of the more popular spots on Mount Royal. Beginning in 1951, the city of Montreal began constructing Beaver Lake. Located on former swamp land, Beaver Lake is small, but beautiful. In the winter, you can go skating, provided the weather cooperates. And in the summer, you can go for a pedal boat ride, take a walk around the park, or throw your picnic blanket out on the grass on the abundant greenspace. What a great way to spend the afternoon! Arriving at the top of Mount Royal, you’ll be rewarded by an amazing view of the city of Montreal from a spacious, and wonderfully designed lookout area. Have your bus driver park at the bottom and walk or ride your bikes up one of the wide, comfortable trails, or just get a ride right to the top. Situated right behind the lookout area is Smith House, a heritage building where you can find out more about the area, and get a bit to eat at the restaurant. However you choose to get there, it’s well worth the trip, and is a great launching point for exploring the rest of the mountain. Not far from Mount Royal is Canada’s largest (and arguably the most stunning) church, St. Joseph’s Oratory. Built in several stages over a period of decades in order to accommodate a growing congregation, the church now has one of the largest domes in the world. More than just an amazing building, the church has a special place in the hearts of local, and visiting, Catholics. Located in a reliquary on site is the heart of Brother André Bessette, who was rumoured to have been blessed with a healing power that he attributed to St Joseph. Regardless of your beliefs, St Joseph’s Oratory is definitely a spot that you will not want to miss on your visit to Montreal. In French, the sign out front reads Charcuterie Hebraïque de Montréal, Inc. To the locals, and to travellers from all around the world, it’s known simply as “Schwartz’s” and is one of the world’s most famous delis. Schwartz’s serves a variety of Jewish deli items, but the reason people come from all over the world is the smoked meat sandwich, which is served on rye bread and contains a uniquely seasoned and smoked brisket. The walls of the deli are lined with pictures of famous restaurant visitors from over the years. Do not miss this spot! There is a wealth of arts and culture to enjoy in Montreal. It’s the home of many world-renowned artists, and has an engaged population that is eager to experience all kinds of artistic endeavours. When you visit, be sure to take your chartered bus with your group to at least one of the following locations. The Montreal Museum of Fine Arts (or Musée de Beaux-Arts in French) is the biggest museum in the city, spread across five pavilions that occupy more than 500,000 sq. ft of space. You’ll find art from all over the world and from every era here. The museum is divided into six sections, where you’ll find a permanent collection that features a wide variety of paintings and sculptures, as well as sections devoted to archaeology and culture. Amongst the themes are Quebec and Canadian art, International contemporary art, graphic arts and photography, and a lot more. Just a few blocks from Old Montreal is the Musée des Maîtres et Artisans du Quebec. This is where you will find a space dedicated to the exhibition of handmade crafts produced by master craftspeople in Quebec. More than just an art exhibition, this space is about celebrating craftsmanship, be it artistic or made for practical purposes. You’ll find objects made by stonecutters, weavers, watchmakers, sailboat makers, ironworkers, and more. It’s an amazing way for you to connect with the people and culture of Quebec. Right in the heart of the burgeoning and delightfully entertaining Quartier des Spectacles district in Montreal, the Musee d’art contemporain de Montreal is an internationally-renowned contemporary arts museum. The museum has been located in three different venues since its inception in 1964. Its current location is dedicated to the exhibition of both performing and visual arts. The museum contains four rooms dedicated to exhibitions of works by international, Quebec and Canadian artists, and another four with temporary exhibitions. There are a lot of great family destinations in Montreal that will thrill, excite, entertain, and even educate you and your group. Here are just a few of the many spots that you can visit with your family while you’re visiting Montreal. La Ronde is an amusement park with tons of rides and other attractions to thrill, excite, and even scare you. It’s built on the former Expo 67 site and is laid out over almost 150 acres. Open from May to October every year, the park boasts some of North America’s most acclaimed rides, with something for people of all ages. Roller coasters, tilt-a-whirls, water rides, and more are featured at La Ronde. You’ll also find a number of different restaurants, and even a bar or two to grab a drink and relax in at the end of the day. The Montreal Biodome is an amazing way to spend a day with the family, located right next to the Olympic Stadium. It’s a science complex where you’ll find animals and vegetation from all over the world. You can walk through four different sections, each of which is dedicated to exhibiting a tiny slice of four different ecosystems that you’ll find in the Americas. The building itself is worth seeing, as the Biodome is located in the former Vélodrome that was built for the 1976 Montreal Olympics. Don’t forget to spend some time with the penguins inside! Sprawled out over nearly 200 acres of lush greenery, the Montreal Botanical Gardens is one of the most important of its kind in the world. With an extensive collection of plants of every corner of the globe, you’ll recognize its importance as you stroll through the estate. One of the highlights of the garden is the Chinese Garden, built to mimic an ornate Ming Dynasty plot. It was built by 50 artisans from China, with materials shipped from Shanghai to encourage authenticity. And it’s just one of many regional attractions you’ll want to explore while you’re there. For those of you who find creepy-crawlies fascinating, the Insectarium is the perfect spot where you can spend an entire day exploring insects of all kinds, both alive and dead. It just happens to be the largest insectarium in North America, and one of the biggest in the world, boasting almost a half a million visitors every year. The insects inside aren’t the only ones on display. In fact, the building itself is shaped like an insect. If your group is set on exploring entomology, then this is the spot for you! You’d be hard-pressed to find a more iconic sports city in North America than Montreal. It’s home to the first ever NHL game, where Jackie Robinson played for the Montreal Royals, and has hosted some of the most beloved teams in sports history. Get your group together on a chartered bus and send them to the game! Built for the 1976 Summer Olympics, the Olympic Stadium (or “The Big O”) is the stadium with the highest seating capacity in Canada. It is instantly recognizable by its flying saucer shape and the tower from which cables are strung to hold up the once-retractable roof. Don’t worry, though. You can come back in 2026 for the World Cup, by which point the roof is set to be restored to its retractable glory. Once the home of the Montreal Expos (now the Washington Nationals), the stadium currently hosts the Toronto Blue Jays pre-season games and a number of different events throughout the year. There’s also an Olympic-sized swimming pool beneath the tower. And don’t forget to get right to the top of the tower to the observation deck and check out a great view of the city! The Centre Bell (or the Bell Center for English speakers) is the home of the Montreal Canadiens hockey team, and so much more. Since its opening in 1996, it has played host to the biggest acts in music, like U2, The Tragically Hip, Beyoncé, Bryan Adams, KISS, and many, many more. Every year, around 1.5 million people visit the stadium, and if you’re with a group, you may want to take advantage of the guided tours to get the full experience. Make sure to take a selfie outside with a statue of your favourite Montreal Canadiens player! Located a little further north of Montreal, just across the river in Laval, is the Place Bell. Slightly smaller than the Bell Centre, with a capacity of 10,000, it has been the home to some of the area’s best sports, music, and family entertainment shows available. Having opened in 2017, the Place Bell is a relative newcomer in Montreal venues, but has made people feel right at home from wherever they come from to attend an event. 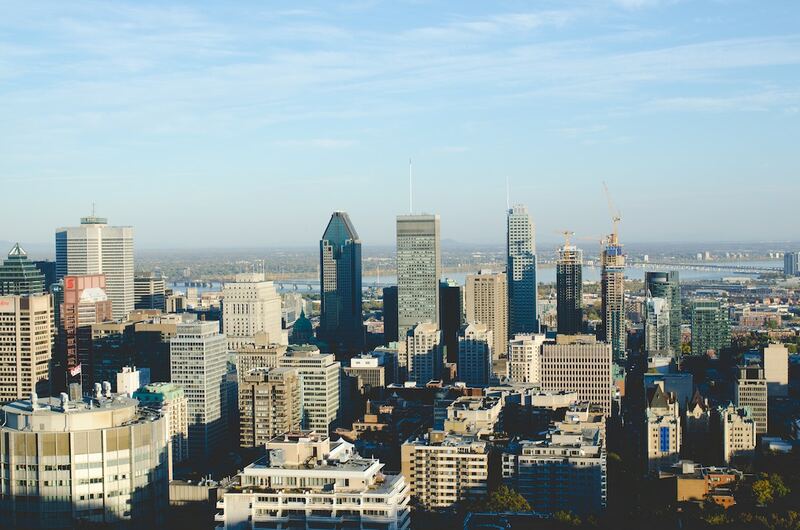 With so much to do in Montreal, you’ll be heading from one side of the island to another with ease when you rent a chartered bus for your group tour. It’ll get you around comfortably, and allow you to appreciate Montreal all the more. Wherever it is that you end up in this great city, make sure that you see at least a couple of the spots on this list. You’ll be glad you did!